Kids can exercise their hands and eyes through play. As children are developing, exposure to a variety of activities will help them thrive. Activities that the children are drawn to provide opportunities to add in skills in natural ways. Playing fine motor & vision games will get them ready for reading and writing. This game is packed with skills yet it is simple enough for young children to do. For some children, it is even more important to introduce skill-building activities. Many of the children that we work with have visual processing deficits. If it is difficult for a child to visually track then many skills such as reading may be tiring for their eyes. The good news is that there are ways to strengthen those muscles that help the eyes to track. The bad news is that many eye exercises are pretty boring. 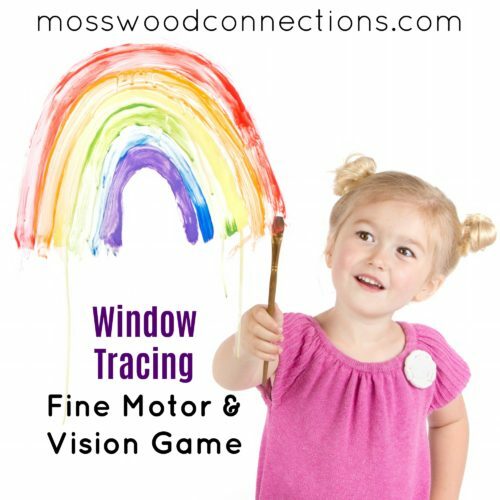 This fine motor & vision game is not meant to replace any exercises that your vision expert may prescribe but it is an engaging way to build tracking and mimicking skills. This game is also perfect for pre-handwriting skills. Writing on a vertical surface has amazing benefits for children. It helps strengthen the core and stabilizes their drawing arm. It encourages bilateral coordination and crossing mid-line. All of this leads to being able to do more difficult tasks as they grow. 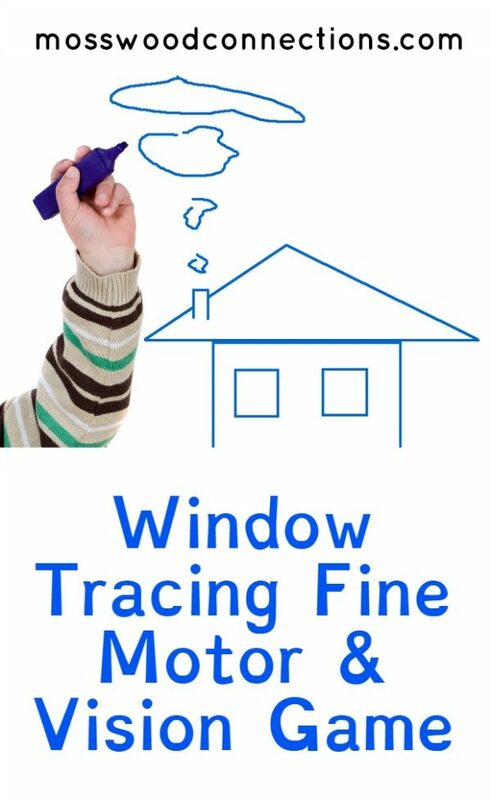 If you have a child that will not be able to discern when it is okay to draw on windows then you should use the clear glass picture frame. Otherwise, you may walk in one day to see very colorful windows. Use the play dough as a base to hold up the window. You will sit or stand on one side of the glass and the child will sit on the other side. Remember that you need to draw in reverse of what the child will be drawing. The object is for the child to follow the lines that you are drawing on their side. So if you want the child to draw a straight horizontal line from left to right then you would start on the right and go left. You can use this activity to help teach the child how to make their letters or numbers. You can ask them to expand on their drawings by adding details. Make it more fun with a story! For the reluctant child, we often find that telling a story to go along with the activity is helpful. You can say, “Put your pen up here in the corner.” (Place your pen on your right upper corner and make a dot.) “This is where Ruby Rabbit lives but she is hungry she wants to find food.” (Make a line to your left, wait for the child to do the same except that they will be moving to their right.) “Ruby went to the field to find carrots but there were none so she decided to look somewhere else.” (Draw a line going down.) “Still Ruby Rabbit could find no carrots so she decided to go to the store.” (Draw a line going in another direction.) You can keep on going until the child’s attention wanders. You can make a dot to dot picture with numbers by the dots and have them connect the dots for number recognition and counting. You can also make a dot to dot picture using the alphabet. Turn it into a cooperative game. Pair up two children and have them take turns being the leader. The kids love this game and you will, too!